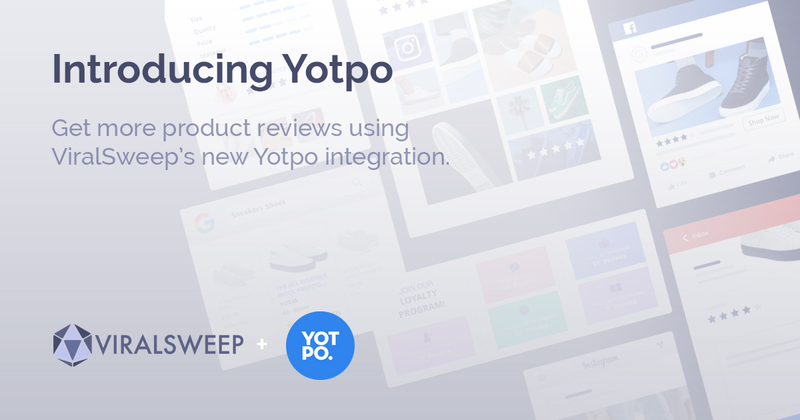 As of today, ViralSweep integrates with Yotpo, enabling our customers to get more product reviews through sweepstakes and contests using our Yotpo Review action. Why have we partnered with Yotpo? ViralSweep provides our customers with the ability to incentivize users with additional entries into a sweepstakes or contest by completing actions. ViralSweep supports nearly 40 different actions; some of our most popular actions being friend referrals, visiting a Facebook or Instagram page, posting a Tweet on Twitter, and visiting a specific website page. And now, Yotpo. 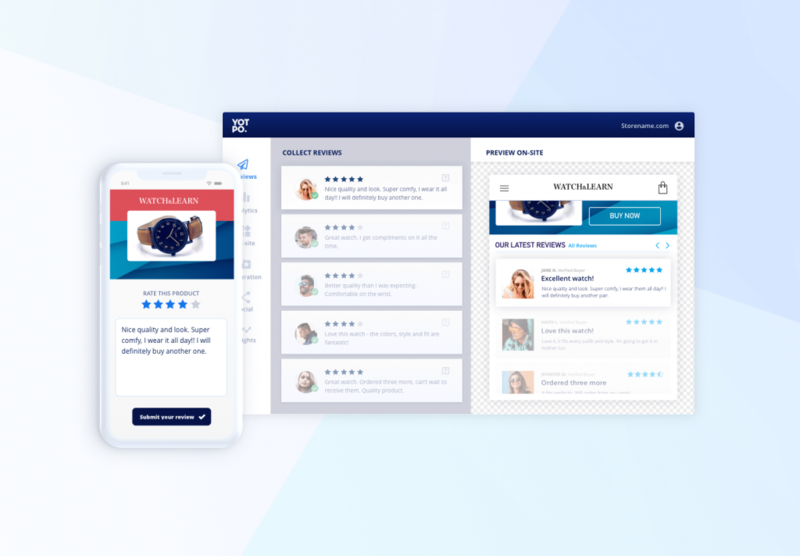 This allows ViralSweep customers who also use Yotpo to collect reviews in their store to collect product reviews using a sweepstakes or contest through ViralSweep. How easy have we made it? Add the Yotpo action while setting up your campaign. Connect to Yotpo with your API credentials. Choose the product you want people to leave a review on. 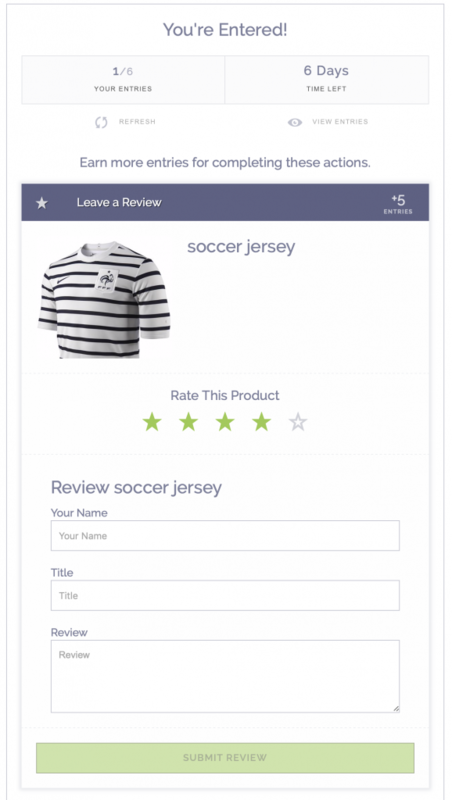 Assign the # of entries to award to each user for leaving a review. What does the end user see? Users will enter your promotion by completing the entry form. They will then be able to complete the Yotpo review action. Once the action is completed, the additional entries are awarded. When running a sweepstakes in the United States or Canada, no purchase is necessary to enter or to win. For offering entries to people leaving a review on a product they’ve purchased, you are also legally required to offer the same number of entries to people who have not purchased that product (or do not want to purchase it). This is called an Alternate Method of Entry (AMOE). When using the Yotpo Review action in a sweepstakes, your sweepstakes official rules should contain a section that offers an alternate method of entry. The most popular “AMOE” rule is the traditional mail-in method of entry—requiring the entrant to mail a postcard to your business address. There are other methods you can use as well. Marden-Kane has a great post that covers different AMOE methods. The Yotpo Review action is available to all customers on our Business Plan and Premium Plan. Thanks to Yotpo and their team for their assistance and support in bringing this integration to life. We’re excited to see how our customers will use it.